Jeb Bush Says Voters' Passions For Trump Will Pass "I think the emotion of the here and now will subside," Bush said in an interview with NPR. He predicts voters will turn on front-runner Donald Trump and see things his way once voting starts. 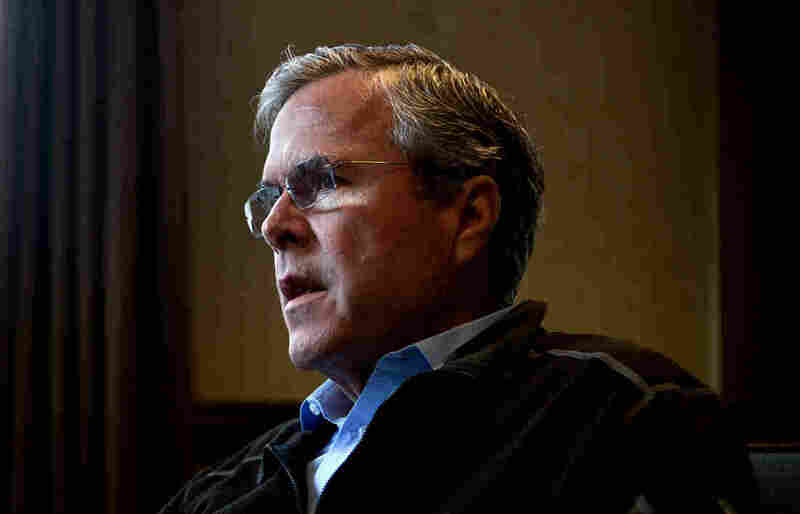 Republican presidential candidate Jeb Bush speaks with NPR's Steve Inskeep on Wednesday in Boston. Earlier this month, in response to terrorist threats, Trump said there should be "a total and complete shutdown of Muslims entering the United States until our country's representatives can figure out what is going on." The plan was renounced by many of his Republican rivals and GOP leaders; Bush himself said Trump had become "unhinged." But polls showed a majority of Republican voters sided with Trump, and Trump's poll numbers went up in the aftermath, too. But Bush believes that will change by the time actual voting rolls around in February. I think the emotion of the here and now will subside. "In a month from now they won't [agree]. That's the point," Bush said. "The point is that we're living in this reality-TV kind of political environment, where [Trump] fills the space by saying outrageous things. People based on their emotions will express support for the sentiment, not necessarily the specifics, because there are none, and then he'll backtrack. And he'll move on to the next thing, and he fills the space." "I think the emotion of the here and now will subside," Bush continued. "Are people scared about the national security interests of our country being violated because of a lax immigration system or a visa waiver program that wasn't designed for people being radicalized? Yes, they're scared, and the job of a president — or a candidate, for that matter — isn't to scare them more; it's to give them solutions, and that's what I'm trying to do." President Obama believes Trump is "exploiting" the anxieties of blue-collar workers in his campaign, as Obama told Inskeep in a wide-ranging interview at the White House this month. Bush said he didn't exactly agree with the president's characterization of the root of that frustration. "[Obama's] got this notion of what blue-collared, white voters kind of think that's so out of touch," he said. "People are legitimately angry with Washington, D.C. And, yes, Mr. President, they're legitimately angry with you. You have divided the country up in all sorts of disparate parts." "I would argue that Donald Trump is in fact a creature of Barack Obama," he continued. "But for Barack Obama, Donald Trump's effect would not be nearly as strong as it is. We're living in a divided country right now, and we need political leaders, rather than continuing to divide as both President Obama and Donald Trump [do], to unite us." Trump continues to lead national polls, but he has seen a dip in some of the early states. Most surveys show Texas Sen. Ted Cruz rising in Iowa. Bush has largely put his hopes in New Hampshire — a state much friendlier to establishment candidates, with its large swath of more moderate Republicans and independents. Still, Bush is lagging there behind Trump and other rivals, including Florida Sen. Marco Rubio, New Jersey Gov. Chris Christie and Ohio Gov. John Kasich. I would argue that Donald Trump is in fact a creature of Barack Obama. But for Barack Obama, Donald Trump's effect would not be nearly as strong as it is. Later Wednesday, the Bush campaign signaled it would be shifting more resources to early states, but with a particular focus on New Hampshire. It canceled planned ad buys in Iowa and South Carolina, pointing out that the superPAC supporting the governor had bought a chunk of ad time there. Next month, the campaign's efforts in the critical Granite State will double to more than 40 staffers. Talking to Inskeep, Bush dismissed the notion that he had to win an early state, New Hampshire included, to remain in the GOP primary fight. "I don't think I have to win any of them, because we're organized in every state," he explained. "So depending on how it plays out, if someone rolled the table, then that would have an impact. Be hard for anybody else to — to overcome it." "The good news is, expectations are low for me, and I'm definitely gonna beat those," he said. "I feel really good about New Hampshire, to be honest with you. Just — just the way it — it feels." People came here illegally; 40 percent of the people that came here illegally, by the way, didn't cross the border. They came with a legal visa and they overstayed. A great nation ought to be able to identify where these folks are for national security purposes alone, but for a lot of other reasons as well. Why should people gain citizenship by coming here illegally? I — I just — I don't quite understand why that is such a compelling moral argument. If anybody doesn't think that they would use whatever means possible to do us harm, I think they're naive. ... We can't be paralyzed in place, and that's where we are today. Whether or not ISIS is the greatest threat that we have in terms of the world, that's debatable. I would say Iran empowered by an agreement that will allow them now to destabilize the region is a serious threat. I would say an unstable Pakistan is a threat. When you have 4 million refugees in Syria — 4 million in camps, literally, you know, millions at a time in Turkey, Lebanon and Jordan — the destabilizing impact that has on those countries and the potential of a breeding ground for Islamic jihadist activity for — for a long, long while, that's a serious threat. When you see the refugee challenges that partially created the tragedy in Paris, that's a threat. I view it as a threat because it's a long-term threat against Western civilization. They effectively have declared war on us. It would be integrity. It would be having a servant's heart. It would be patriotic, loving the country. And in my case, you know, look, I'm a conservative. But I believe that conservatism needs to be applied in a hopeful, optimistic way. And I think that's another part of the Bush brand that I hope people will be reminded of — that it's a hopeful, optimistic message, not a divisive one.